PinChick's Kiss Kiss, Plus More! I think these would work as earrings too. Below is a wonderful dress picture that was sent all the way from Italy to me, after posting Thumblina's dress. She loved it and made one of her own! Looks Great Ada! I love the variegated color! and it is fun to make the hanger too, it just the finishing touch. Margarets Designer Cards check with Margaret for the little dress pattern! one more chain and attach and end. While we were waiting to see if she was going to go through with the game, I decided to guess what the next round would be, and so I like it enough to keep it and keep making a guessing game that I play. that would be a cool challenge huh? Chalice Cover In Florescent ! Exciting bright but maybe to modern for me. I am trying capture the color on camera. The colors are from this "Artise" brand embroidery thread. 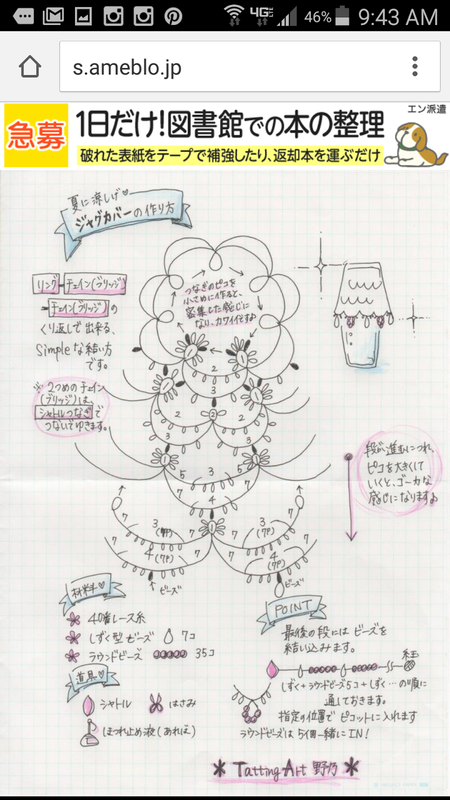 Here is the lovely pattern given freely by the artiste on Instagram. This time I really wanted to get the center right. and choose this method. I didn't tie it off till closer to the end, I have rough time seeing and knotting at the end and get the rings out of order. below one is size 40 and other is 80. Have a wonderful Sunday and rest of the week too. A simple knot to tie three shuttles together, two colors can be the same. And one shuttle can be a ball of thread. Leaving one of the three shuttles out, as you begin a chain of 5 double stitches divided by 2 picots, then trim your hidden threads. Form a U shape, and drag the thread we put aside at beginning over to form the next U on opposite side. In this case the purple thread. Note keep that single thread a bit short, it will stretch a bit. Repeat to form the pearls of the chain to a length you desire, Wait here for next instructions I will post shortly, or you can try to go on too next row on your own. 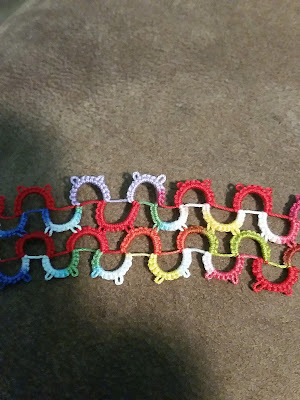 This was done with two variegated threads and red I did shoe lace trick at times but really don't recommend, cause I was originally trying to clean off shuttles..
All chains, and all fun in size 20 thread. Something about this look, I just love. It is different and I originally was cleaning off my shuttles. This was a bit of a mind teaser with 3 shuttle but enjoyable. I saw something like this and it was square and spun from the center. This is done with out breaking the thread making a strip then a turn and then another. I was so busy in April I forgot to show what I made for grandchildren with felt. Two different tails beaded and two had buttons. I love sewing felt. Rabbits really do hide in vegetables you know. 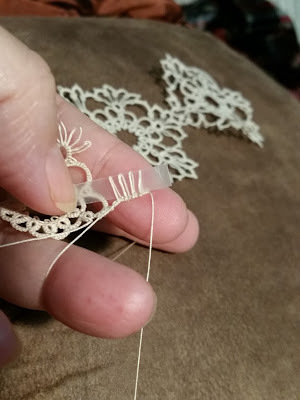 I really enjoyed tatting this little doily made from a motif from a book called " Tatted Artistry "
I cut out a piece of plastic an wrapped around to get all picots same size. there are two different ways to put together, I liked this the best. 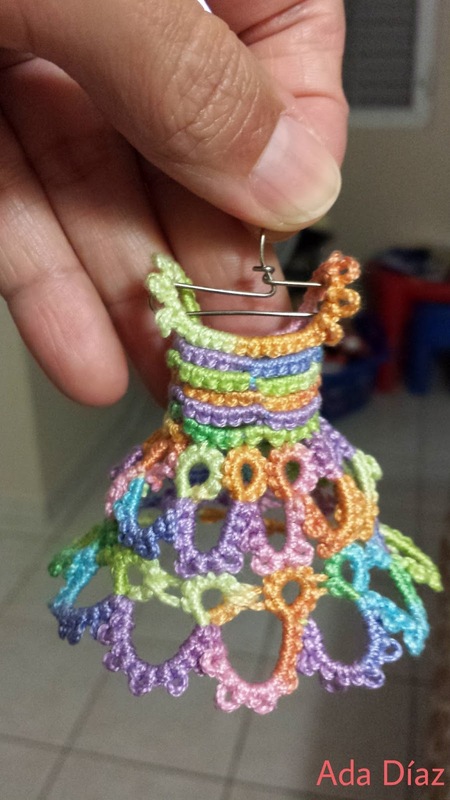 have a great tatting Day! Tatted lace dress finds an owner! You can use a wooden bead or this time I had a bead I purchased on Ebay! One wire folded in half and looped through head then arms and so on. Craft glue to wire, and a peach tatting thread. I made arms too long and snipped them shorter just dipped the ends in glue so thread won't run away. Shoulder straps too long, and tied them together in back. I just tatted rings in black for hair to match the China girl face then left long ends and attached to wires from frame in back of head. This pattern was recreated by Margaret since the original artist is unable to do this, Margaret did a wonderful job and this was my Pinterest Pick for last month. I have been so busy and not doing much blogging but thought I would let you all know I am still here.